As an adventure and outdoors lover sometimes it’s difficult to live in a concrete jungle. Did you know that there are ton’s of active things to do hidden in this remarkable city? I’ve put together a list of incredible experiences in the New York area. Some I’ve done, some I still need to do. Either way it’s a fun way to spend your time in NYC! 1. Rock climbing at Brooklyn Boulders: Brooklyn Boulders is a dedicated rock climbing facility and dynamic, creative community. With 22,000 square feet of climbing surface and a committed and skilled route setting staff, they can offer both a premium training ground for advanced climbers and a variety of climbs for the total beginner. They also offer yoga, acroyoga, capoeira classes + a variety of fitness workshops. Check out our experience here. 2. Kayak Polo: Yes, this is a thing. The New York Kayak Polo club is devoted to developing and promoting the sport of Kayak Polo (also known as Canoe Polo) in the New York City area. It is a team sport, played with five players per team in specially designed kayaks on calm water. The object of the game is to score goals in a net suspended 2 meters above the water. It is a fast and active team sport, similar to both basketball and water polo, and a great way to improve boat-handling skills and rolling. More details about the game, their programs (introductory, new-player, and regular sessions), schedules, and other information are available at their website here. 3. 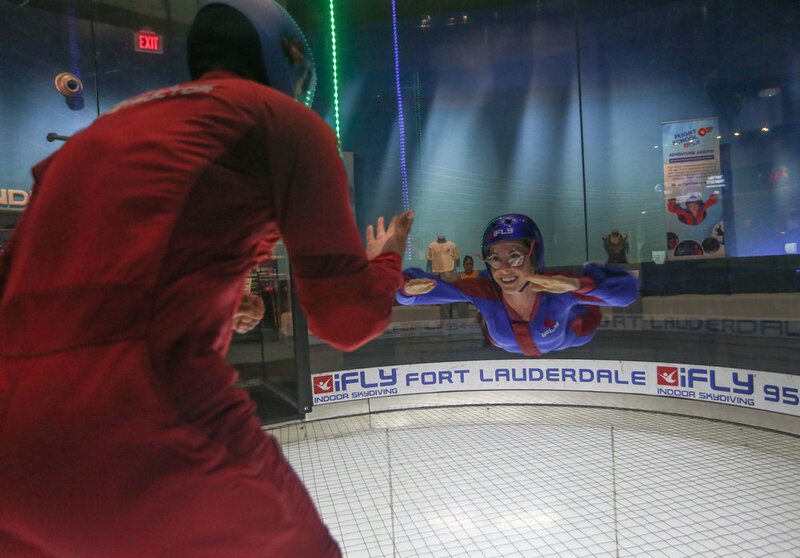 Indoor Skydiving: At iFLY in Westchester you can test your skydiving skills before jumping from a plane in their innovative simulated indoor skydiving vertical wind tunnel. This invention has given skydivers a consistent and practical way to develop and hone skills that usually require jumping from a plane. Additionally, the increase in availability of wind tunnels has created a whole new genre of sport – bodyflight. It is one of the most exciting and fastest growing sports in the world. To find out more about the world of bodyflight including news, competitions and flying technique videos, visit their site here. 4. Flying Trapeze: Overcome your fears and do flying trapeze! We LOVED this. See our experience here. The members of Elizabeth Streb’s company, STREB (originally Streb/Ringside), combine virtuosity and technical skill with openhearted popular appeal. Founded in New York City in 1985 by choreographer Elizabeth Streb, the company has traveled, artistically as well as geographically, from the heights of the experimental dance world to the cutting-edge of popular entertainment. There are any types of classes available including acrobatics, trampoline, parkour and more. 5. Bubble Ball Soccer: Yes, this exists! We tried it. Check out our video here. Bubble soccer NYC is the premier game for local extreme sports / activity lovers! Spend an exhilarating hour facing (and bouncing) off fellow adventure seekers to score goals for your team. It's the most fun you'll have at a pick up game since - ever! The game is designed for intense cooperation and working together. This is a perfect way for the office, community, or any other group / organization to get out for a high quality team building / bonding exercise. 6. Archery: Learn how to use a bow & arrow like Katniss from Hunger Games! This is another fun experience we’ve done. Although I can’t aim, I still had a great time. If you are a first time archer looking to rent equipment they have 2hr rental packages for adults $20 per person and $15 per youth (8-17 years old). This package includes the rental of equipment, time on the range, instruction on archery technique and range safety. 8. Chelsea Piers: This is New York’s Ultimate Playground. They boast 25+ sports for youths and adults including basketball, boxing, figure skating, golf, gymnastics, sand volleyball and much more. I take adult gymnastics classes here and love it! 9. Horseback ride in Central Park: In Central Park, horseback riding is permitted year-round during regular park hours. The recently reconstructed Central Park bridle path is more than six miles long and encircles the Reservoir as well as the North Meadow. Horseback riding has been a tradition in Central Park for 150 years, dating back to when the park was originally designed. There is some evidence that Central Park was originally meant to be seen from horseback. Trails such as the bridle path adjacent to the Reservoir are made of hard, packed dirt and are as perfect for horseback riding today as they were when the park opened. 10. A day at the pool: Whether you want to cool off in the summer, or get fit in the winter, there’s nothing like taking a refreshing swim! NYC Parks goal is to get you in the water year-round. Head to their free summer outdoor pools and become a recreation center member to give their indoor pools a try! For more information click here. 11. Skydiving: If skydiving is on your 'bucket list' you need to check out tandem skydiving with Skydiving Over New York! Join them for the most heart-pounding ways to experience the thrills and excitement of complete free fall skydiving over New York. It is one of life's biggest and best journeys. The feeling is indescribable, and the buzz lasts for days. Discovering skydiving definitely will change your life! 12. Fly a Plane/Helicopter: You have the dream to fly Academy of Aviation can make your dream a reality and give it wings. Take an introductory lesson in a cessna or helicopter to get a feel for flying in a small plane. If you love it, you could pursue a pilot's license! 13. Surf at Rockaway Beach: Locals Surf School was founded in 2011 by two lifelong surfer/skaters and locals of Rockaway Beach, NYC. Founders Mike Reinhardt and Mike Kololyan saw an opportunity to fill a void in the New York City surf lesson sector by providing quality training from knowledgeable locals who had a passion for the sport and culture. Over the past five years, Locals Surf School has grown into an established brand that is recognized for its excellent service, and deeply authentic surfing roots. Now they are doing more than ever by offering all types of surf and skate lessons, camps for kids, charity programs, contests, festivals, parties and more! 14. Skatepark: The Hudson River Park's Pier 62 Skatepark is FREE and is open to all skateboarders and rollerbladers. This is a 15,000 sq. ft skatepark designed and built by California Skateparks/Site Design Group. It features a 5 ft spine, beginner Ollie Zone which includes a 4 ft Quarter, 2 ft Wedge and a 3 ft Start Box and the Intermediate Fun Box including a 24 ft Ledge, a Kinked Flat Rail, and an 18 ft Ollie Ledge. For a full list of NYC’s skateparks click here. 15. Deep Sea Fishing: Want some real fishing action? How about a trip for some Gorilla Blues and Trophy Striped Bass? The Marilyn Jean IV sails EVERY evening fishing for Stripers and Bluefish so they always have have the most up to date information on where to find the fish whether in the bay or the ocean. They can customize a fishing trip to suit your needs exactly. Whether you would like a full day 7 hour trip or a half day 4 hour trip, The Marilyn Jean IV or Captains Lady can make it happen! They are also available for night fishing trips to accommodate those of you who are night owls. With her bright lights stationed all around the deck, it makes fishing fun and easy all night long! 16. Kayak, SUP & Surf Ski: There is no experience like kayaking along the NYC skyline. We recently did this and loved it! See our article here. Founded in 1995, Manhattan Kayak is NYC’s premiere kayak and SUP school and sightseeing company. After half-circumnavigating Australia by kayak and riding the rest of the way on a bike, Eric Stiller returned to New York to sow the seeds of adventure for others. Manhattan Kayak takes a core-centric approach, helping kayakers and SUPers to explore New York City in unique and thrilling ways. Their daily kayak and paddle boarding programs are easy to do and offered May 1 to November 1. 17. Bike ride in Central Park or along the Hudson River Greenway: Central Park Sightseeing offers both bike rentals and bike tours around the city. What could be better than a guided bike ride in Central Park, the first landscaped public park in the USA? Your guide, a city-licensed professional, rides alongside you and shows you all that the park has to offer: Bethesda Fountain, hidden waterfalls, cast-iron bridges, movie scenes, celebrity homes, skyscrapers… all while passing beneath many of the park’s 26,000 trees. You’ll learn the history of New York City, told in terms of the development of the city and its parks. You’ll even bike right up to Strawberry Fields, the memorial to the life of John Lennon, and see the famous building where he lived. 18. Mountain Bike: You may not think it’s possible to mountain bike in the city… Think again! Cunningham Park is one of the most iconic mountain bike spots in NYC. It's located right in Queens with some of the best maintained trails in the area. If Queens is a bit too far for you, check out the NYC Mountain Bike Association's list of best spots in/around NYC here. 19. Play Tennis: As the host site for the U.S. Open, New York features some of the best tennis players in the world. Tennis for sport or fun is available to all New Yorkers with a tennis permit. Each borough has many tennis courts. To find the court closest to you click here. 20. Spend a day at the beach: NYC Parks maintains 14 miles of beaches which are open from Memorial Day weekend through Labor Day. During beach season lifeguards are on duty daily from 10 a.m. to 6 p.m. To find the beach closest to you click here. 22. Snowboard & Ski: Sourced Adventures gives you the advantage of being able to relax and enjoy your trip, book lessons and/or rent gear at a low cost. They offer a variety of trips to seven of the closest mountains to NYC. 23. Ice Skating: There are 7 ice rinks in the NYC area. Find the closest, slap on some skates and glide across the ice. To find the one closest to you click here. 24. Go Tubing: It’s good to remember that there’s an alternative to skiing, snowboarding, and making angels in the snow. Forget the boots, the goggles, the gear, and enjoy the simple thrills of snow tubing—because sitting is really all that’s involved in this, err, sport. Bring warm clothes and an appetite for some fast-paced fun and you’re good to go at these three cool snow tubing spots near New York City. 25. Cross Country Ski: Consider cross-country skiing as a way to free yourself from the frosty concrete jungle of Manhattan. The beautiful white noise of open forests and snowboarder-free mountains are merely a train or bus ride away. These cross-country skiing escapes near NYC are all close enough to be a day trip, but just far enough to make you forget the city. 26. Ice Climbing: Alpine Endeavors offers guided ice climbing daily at their home locations in the Catskills and Adirondacks, as well as other areas around the Northeast. They have private trips, group trips and some specialty programs all designed to provide you with an amazing experience. Do one of these every two weeks and you’ll be busy adventuring for a year without leaving NYC. Happy exploring!